Alternative financial markets are typically comprised of tangible goods. Types of alternative investments include real estate, art, antique furniture, fine wines, classic cars, or even rare baseball cards and comics. While these assets may be illiquid, they are considered to hold exceptional quality and value over the long-term. 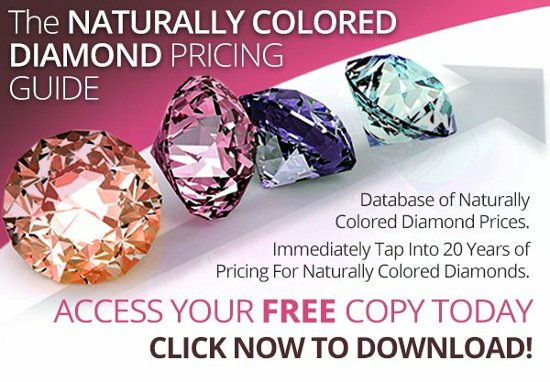 One of the rarest and most sought after investments in alternative investing is that of high quality gemstones, and especially the area concerned with the acquisition of naturally colored diamonds. While investing in precious stones may be considered an action solely related to the millionaire or billionaire classes, recently it has garnered the attention of many small investors and private buyers. The latter classes have begun to see this category as a stable asset class they can trust to maintain its value or even appreciate in the long run. This can further be supported by the fact that colored diamonds, while affected by the global financial recession, took a much lighter hit when compared to other assets, and even began to recover their value within a year. This has led investors to prefer rarer stones (such as Blues and Pinks) as they offer high value, steady appreciation and low volatility. Such qualities safeguard the diamonds against inflation, and help them keep their value steady even when the stock market is crashing. 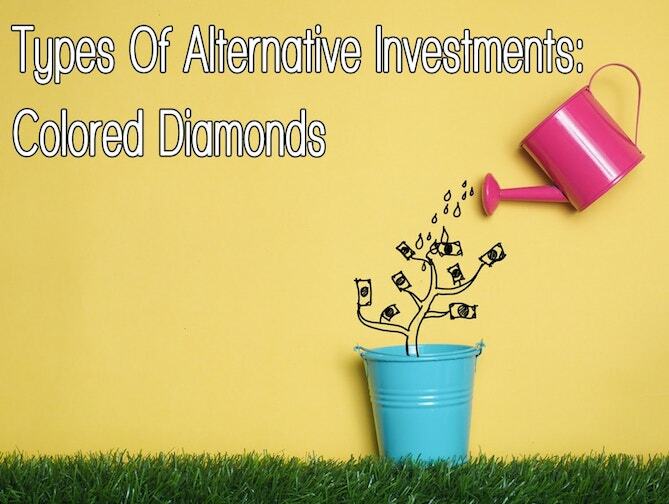 It is therefore safe to assume that the popularity of colored diamonds as alternative investments has risen to a degree where they can be considered assets on par with (or even surpassing) precious metals such as gold and platinum. It should be noted however, that careful selection and examination of stones is necessary and should be done in conjunction with a professional in the diamond trade. This process includes purchasing from reputable dealers, having your investment diamonds appraised by reputable appraisers, and most importantly certified be renowned gemological institutions such as the GIA. While some traditional financial contusion tends to down talk alternative investments such as fancy colored diamonds, there is sound proof supporting the opposite. 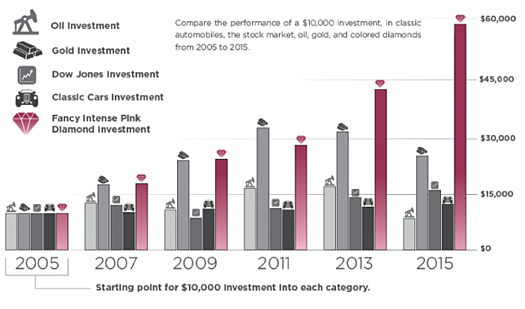 As we can see from the illustrations below, pink diamonds have shown a massive appreciation of 381.5% during the period of January 2005 to April 2017. Moreover, blue diamonds have shown an appreciation of 248.3% and yellows appreciated by 48.2% during the same period. Colored diamonds represent less than 1 percent of the world’s total diamond output. With no new commercially viable sources of colored diamonds on the horizon, coupled with aging mines and high costs of converting from pit mine to underground, the rarity of these stones will only increase, and thus so will their value. Perhaps the biggest example of grand contributors slowly withering away is the famous Argyle mine. This mine has been the world’s largest source of truly unrivaled pink diamonds since 1985, contributing to 90% of pink diamonds globally. Despite its impact on the industry, its resources have almost been depleted and is programmed to cease operations in 2020. While mining technology is always advancing, currently there are simply some diamonds and locations deemed commercially unviable to mine. Some historic mines are even scrounging diamonds out of their mountains of tailings when pit and underground operations have ceased. Demand is expected to significantly outstrip supply within the next decade, so purchasing and holding stones is something prospective investors should consider as a strategic long-term investment and should not be expecting nor considering a short-term flip. If you enjoyed this article check out some other great reads from the list below. And as always feel free to follow us on Facebook and Twitter.